E2 The messenger is sent and Ananda is rescued. It takes a person with great wisdom to rescue a stupid person. Although Ananda had certified to the first fruition of arhatship, his samadhi-power was not enough to keep him from being confused by Matangi’s false mantra. To save him, the Buddha manifested a hundred rays of jeweled light, and a thousand-petalled lotus, and a transformation-body Buddha who spoke the Shurangama Mantra. Still, Ananda was a long way off, and so the Buddha needed a member of the Sangha to take the mantra and go save Ananda. 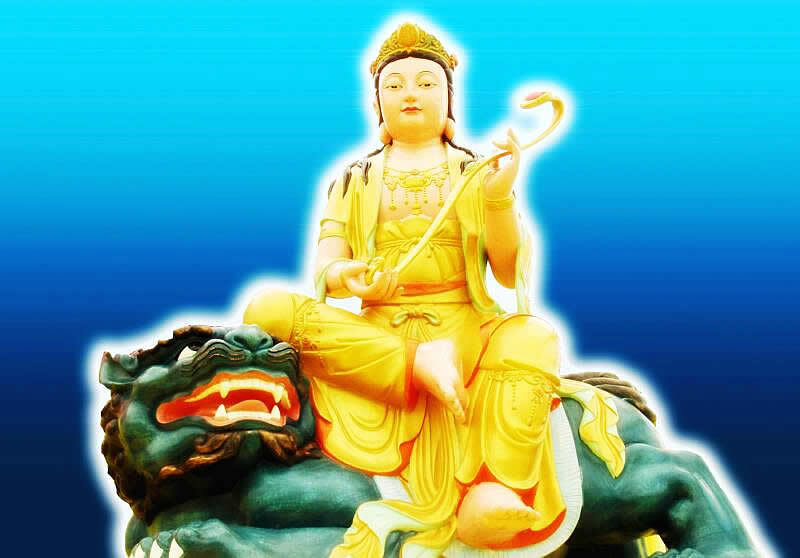 So Shakyamuni Buddha commanded Manjushri to take the mantra and go provide protection. He was to go to the house of prostitution, the home of Matangi, and rescue and protect Ananda. Within the Shurangama Mantra are several phrases that are specifically directed at breaking up externalist dharmas; in this its efficaciousness is unsurpassed. As soon as Manjushri went to Matangi’s house and recited the Shurangama Mantra, the evil mantra was dispelled. The “mantra purported to have come from the Brahma Heaven” was no longer efficacious. Ananda woke up. The Bodhisattva Manjushri then needed to lend support, and to encourage Ananda and Matangi’s daughter to return to where the Buddha was. Ananda had been confused by the mantra-trick and had just “come to,” so he was disoriented and had no idea where he was; it was as if he had just awakened from a dream. So Manjushri Bodhisattva lent him support, took hold of him and pulled him up. ”Why did he encourage Matangi’s daughter?” you ask. If he had not encouraged her at that time, her own life would have been in danger and perhaps his as well. She was so distraught she might have tried to kill Manjushri Bodhisattva for having taken away the one she loved so much. Had he not reassured her at that point, she would have been beside herself. Who knows what she might have done out of her jealousy? Manjushri Bodhisattva said, “You are a very beautiful girl. I can see you are a good woman. Come along with me and we will go talk things over with the Buddha and find out if your wishes can be fulfilled. I’ll put in a good word for you. It will all work out, I’m sure.” He chose his words carefully, expediently, being discreet and tactful so as not to arouse her anger or cause her to harm or kill herself. With Manjushri supporting Ananda and encouraging Matangi’s daughter, they returned to where the Buddha was, to the sublime abode of the Jeta Grove. From “Thus I have heard” to this point in the text is called the “preface.” The preface includes the “testimony of faith,” that is, the section that fulfills the six fulfillments, and certifies that the sutra can be believed. The entire preface is also called the “postscript,” although it comes at the beginning of the sutra. The preface is also called the “general preface” because other sutras also have similar prefaces. It is called the “foreword” as well, because it is placed at the beginning of the sutra, even though it was written after the sutra was spoken. The second part of the preface is called the “prologue.” It explains the causes and conditions involving Ananda and Matangi’s daughter that led to the speaking of this sutra. It is important for those who study the Buddhadharma to be able to distinguish the various sections of the sutra text. In this way one can come to “deeply enter the sutra treasury.” Boring your way in you will come to have “wisdom like the sea.” In fact you should think like this: “It is I who spoke this sutra. Its principles have come forth from my heart.” If you can be like that, in such a way that the sutra and your basic substance become one, then there will be no deep and no shallow. You will no longer feel that the study of sutras is difficult, but will take it as a matter of course. The text of the Shurangama Sutra is extremely well written. Of all the Chinese classics, such as the Four Books and the Five Classics, none is a finer piece of literature. I regard the Shurangama Sutra as the ultimate in literary texts, wonderful to the extreme. People who wish to study Chinese should not miss the opportunity to penetrate the Shurangama Sutra text. Anyone who does so will have a thorough foundation in the Chinese language and will be able to understand all of Chinese literature. C1 A complete explanation of the wonderful samadhi for accomplishing Buddhahood. E1 He regrets excessive learning and requests samadhi. Manjushri Bodhisattva had used the Shurangama Mantra to rescue Ananda, and after a time on the road, during which a gentle breeze probably sprang up, brushing softly against their faces and bringing Ananda awake from his dream, they reached the Jeta Grove. Ananda saw the Buddha, bowed, and wept sorrowfully. His grief was extreme. Sorrow welled up from deep within him and he wept silently, out of remorse. The finest word in this section of text is the word regretting, because it indicates that Ananda had awakened. If he hadn’t been regretful, then upon returning to the Jeta Grove he still would not have been able to be honest about what had happened. He would have returned to where the Buddha was and acted as if nothing had happened. He would have put on a front. The very best thing about Ananda was that he didn’t put on a front. He came back, faced the Buddha and bowed, without any pretences, because he knew he had to correct his errors and change his ways. He wanted the Buddha to teach him new paths. Because of this, he was able later to realize enlightenment. From time without beginning means not just this time in this present life, but many lives, many eons past, from the time Ananda very first became a person. No one could say when that was, so it is referred to as time without beginning. He had been preoccupied with erudition. Life after life, time after time he had concentrated on his studies, so that he had developed “great learning and strong memory”; but he had neglected to develop, had not yet perfected his strength in the Way, that is his samadhi-power. His samadhi-power was very meager, extremely immature. Fortunately, Shakyamuni Buddha had rescued him, so he placed himself on the ground in obeisance, paying deference with his body and mind. He respectfully and repeatedly bowed over and over again, without being the least bit lazy about it. He requested of Shakyamuni Buddha that the Buddha explain the principle by which the Tathagatas of the ten directions had realized Bodhi. He didn’t ask the Tathagatas, the Thus Come Ones of the ten directions to speak; you should not misread the text at this point. If Ananda was asking the Buddhas of the ten directions to speak, what was Shakyamuni Buddha doing there? He was Shakyamuni Buddha’s disciple; would he have ignored what was right before him and gone seeking instead for some distant Buddhas of the ten directions? No; the text means that he turned to Shakyamuni Buddha and asked him to explain what doctrine the Tathagatas of the ten directions had relied on to become enlightened. Ananda didn’t know what skill he ought to develop in order to realize Buddhahood; but he had heard of three kinds of samadhi - shamatha, samapatti, and dhyana; so he brought them up and referred to them each as wonderful, in order to emphasize them. As soon as Shakyamuni Buddha heard his request, he knew Ananda was an outsider: that he didn’t know about the samadhi for realizing Buddhahood. And what is the samadhi for the realization of Buddhahood? It is the Shurangama Samadhi. It was just because Ananda didn’t understand the Shurangama dharma-door that he proceeded to bring up a lot of arguments, as the text describes below. The very first expedients. Ananda wanted to know about expedient dharma-doors for the beginner, the easiest way to start cultivating, the simplest methods of practice. Some people have immediately become prejudiced. “Ananda concentrated on erudition and almost ended up by falling,” they say. “Obviously it is useless to study a lot. I’m going to cultivate samadhi exclusively, and not study at all.” This one-sided view is not in accord with the Middle Way. The principle of being in accord with the Middle Way is to be neither too far to the left or too far to the right, or too far in front or too far behind. Ananda was also prejudiced because he concentrated on learning and neglected samadhi. But if you concentrate exclusively on samadhi and neglect learning, your wisdom won’t develop. You must study to gain understanding, and you must also practice to gain samadhi, and then the two will be integrated. At the Buddhist lecture hall we both investigate sutras and meditate. By putting aside everything else and not letting your mind wander to the north, south, east, and west, you can concentrate your whole attention on the Buddhadharma. Don’t waste valuable time. Don’t just chatter on at random or do things which are of no benefit. You can’t make squares and circles if you don’t have a compass, and in the same way, you have to follow the rules in your daily practice. In the Chan hall, when the wooden fish is hit three times it is a signal to stop and be still. During that period no one should talk. Those who do may receive a beating from Wei Tuo Bodhisattva’s jeweled pestle. ”He hasn’t hit me yet,” you say. He hasn’t gotten angry yet. But when he does, things get serious fast. So everyone should take care to genuinely follow the rules. When the rules are followed, there can be successful accomplishments. Don’t be so casual. The people in this assembly are basically very well-behaved, but just in case some may have forgotten the importance of the rules I am mentioning them once again. During the period set aside for study of the Shurangama Sutra, all should single-mindedly apply themselves to the study of the sutra and to their meditation. If you do, I can guarantee there will be a response and you will have some accomplishment. If you do not become greatly enlightened, you will certainly gain a little enlightenment. You won’t miss out on the merit and virtue. If you are sincere and single-minded during this period of study and practice, you will certainly gain some advantages. I am not cheating you. However, if you don’t follow the rules you’ll be like the Mongolian who goes to the opera and misses out altogether. You’ve come from far away for no other reason than to study the dharma, and that makes me very happy - so much so, that no matter how hard I have to work I don’t fear the suffering. During the dharma assembly I am determined to research and explain the sutra, do everything in my power to bring the sutra out in the open for you. It is my hope that all of you will obtain the advantages to be gained from the Buddhadharma. However, although I say this, whether you listen or not is still up to you. If you chose not to listen, there is nothing I can do, because I am not you and you are not me. You can also say that you are me and I am you. How? We are connected to one another in that we breathe the same air. Thought of in this way, everyone becomes one identical substance, and so you shouldn’t obstruct me and I shouldn’t obstruct you. Everyone investigates the Buddhadharma together and becomes enlightened together. If there is one who has not yet become enlightened, then I will not have fulfilled my responsibility. Pay no attention to whether the Buddhadharma seems deep or shallow. You should resolve: “If I understand, I will investigate further, and if I don’t understand, I want to investigate even more.” Understanding a little is a lot better than not understanding anything at all. You should say to yourself: “If I understand one word of the sutra the dharma master is lecturing, that’s one word which I never understood before, and that makes it worthwhile; I’ve obtained advantage.” The value of that single word is inexpressibly great. Why was Ananda unable to resist the mantra “formerly of the Brahma Heaven,” since he had after all reached the first stage of arhatship? It was because in the past, in cultivating samadhi, he had used his conscious mind. The conscious mind is subject to production and extinction and is not ultimate. A samadhi which is developed by using the thought-processes of the conscious mind, such as the “stop and contemplate” method of the Tian Tai teaching, involves the eighth consciousness. It does not address the nature which is neither produced nor extinguished. If one bases one’s work on the nature which is neither produced nor extinguished, one can cultivate a samadhi which is neither produced nor extinguished. That is a genuine samadhi, one that cannot be moved by outside forces. But Ananda used only his conscious mind in whatever he did. For instance, when he listened to sutras, he used his mind to remember the principles the Buddha spoke. But the conscious mind which remembered the principles cannot lead to the fundamental solution. So when Ananda encountered a demonic state, he failed to recognize it. It is essential for people who cultivate the Way to be able to recognize their environment. If you can recognize states when they arise, you won’t be influenced by them. They won’t move you. Samadhi-power can be victorious over any state whether it be good, bad, agreeable, or disagreeable. In the midst of them all, you can remain “thus, thus, unmoving, completely and eternally bright.” That is genuine samadhi-power. If happy situations make you happy and sad events make you sad, you’re being influenced by states. If you keep jumping from joy to anger, to sorrow, to happiness, you’re being influenced by states. Not to be influenced by external states is to be like a mirror: when something appears it is reflected, when it passes there is stillness. The basic substance of the mirror is always bright. It cannot be defiled. To have samadhi-power and not to move is to have genuine wisdom, thorough understanding. It is very important to understand this. ”Shamatha” is a Sanskrit word which is interpreted to mean “still and pure.” However, it is a stillness and purity which is forced. One attains a kind of samadhi by deliberately forcing the mind to have samadhi-power and not to strike up false thinking. It is not the ultimate samadhi. It is merely a kind of expedient device cultivated by those of the small vehicle. At the very beginning of his teaching, Shakyamuni Buddha taught this method to those of the two vehicles. ”Samapatti,” also Sanskrit, is interpreted to mean “contemplation and illumination” of such dharmas as the twelve links of conditioned causation and the four truths. ”Dhyana,” also Sanskrit, is interpreted to mean “thought-cultivation” or “still consideration.” One uses the mind to trace the coming and going of thoughts, in much the same way as in the cultivation of “stopping and contemplating.” The Tian Tai school lists three stoppings which relate to the three contemplations: empty, false, and the middle. That teaching is basically a good one, but it is nothing compared to the Shurangama Samadhi. Dhyana can be ultimate or non-ultimate. Those of the small vehicle cultivate using the conscious mind; they make discriminations using the conscious mind. Since the conscious mind is subject to production and extinction, its use will not lead to the genuine solid samadhi of the Buddha. ”What should we cultivate?” you wonder. Because I myself am standing on the mountain. If he had walked away from it, though, he could have seen. Now we are within the Shurangama Samadhi; you are boring your way into the Shurangama Samadhi and if you continue to progress you will gradually come to see it clearly. Then you will know you have obtained a real gem. You’ll be able to climb the jeweled mountain, grab two big fistfuls of gold, fill your arms with the gems and go back down the mountain. Even if you continually take from it, the supply will never be exhausted. It will be an endless supply, more than you could ever use in a lifetime. In the future you will be able to achieve the Shurangama enlightenment and then go on to teach and transform living beings.